If your instructor has specific requirements for the format of your research paper, check them before preparing your final draft. When you submit your paper, be sure to keep a secure copy. Except for the running head (see below), leave margins of one inch at the top and bottom and on both sides of the text. If you plan to submit a printout on paper larger than 8½ by 11 inches, do not print the text in an area greater than 6½ by 9 inches. Always choose an easily readable typeface (Times New Roman is just one example) in which the regular type style contrasts clearly with the italic, and set it to a standard size, such as 12 points. Do not justify the lines of text at the right margin; turn off any automatic hyphenation feature in your writing program. Double-space the entire research paper, including quotations, notes, and the list of works cited. Indent the first line of a paragraph half an inch from the left margin. Indent set-off quotations half an inch as well (for examples, see 76–80 in the MLA Handbook). Leave one space after a period or other concluding punctuation mark, unless your instructor prefers two spaces. Beginning one inch from the top of the first page and flush with the left margin, type your name, your instructor’s name (or instructors’ names, if there is more than one instructor), the course number, and the date on separate lines, double-spacing the lines. On a new, double-spaced line, center the title (fig. 1). Do not italicize or underline your title, put it in quotation marks or boldface, or type it in all capital letters. 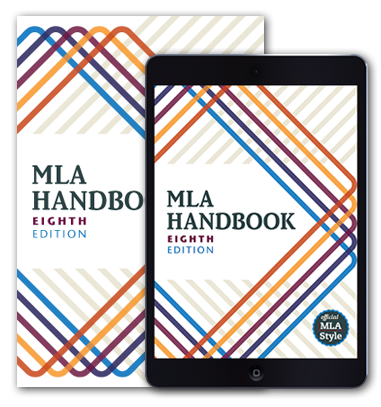 Follow the rules for capitalization in the MLA Handbook (67–68), and italicize only the words that you would italicize in the text. Do not use a period after your title or after any heading in the paper (e.g., Works Cited). Begin your text on a new, double-spaced line after the title, indenting the first line of the paragraph half an inch from the left margin. Fig. 1. The top of the first page of a research paper. Number all pages consecutively throughout the research paper in the upper right-hand corner, half an inch from the top and flush with the right margin. Type your last name, followed by a space, before the page number (fig. 2). Do not use the abbreviation p. before the page number or add a period, a hyphen, or any other mark or symbol. Your writing program will probably allow you to create a running head of this kind that appears automatically on every page. Some teachers prefer that no running head appear on the first page. Follow your teacher’s preference. Fig. 2. The running head of a research paper. The list of works cited appears at the end of the paper, after any endnotes. Begin the list on a new page. The list contains the same running head as the main text. The page numbering in the running head continues uninterrupted throughout. For example, if the text of your research paper (including any endnotes) ends on page 10, the works-cited list begins on page 11. Center the title, Works Cited, an inch from the top of the page (fig. 3). (If the list contains only one entry, make the heading Work Cited.) Double-space between the title and the first entry. Begin each entry flush with the left margin; if an entry runs more than one line, indent the subsequent line or lines half an inch from the left margin. This format is sometimes called hanging indention, and you can set your writing program to create it automatically for a group of paragraphs. Hanging indention makes alphabetical lists easier to use. Double-space the entire list. Continue it on as many pages as necessary. Fig. 3. The top of the first page of a works-cited list. Place tables and illustrations as close as possible to the parts of the text to which they relate. A table is usually labeled Table, given an arabic numeral, and titled. Type both label and title flush left on separate lines above the table, and capitalize them as titles (do not use all capital letters). Give the source of the table and any notes immediately below the table in a caption. To avoid confusion between notes to the text and notes to the table, designate notes to the table with lowercase letters rather than with numerals. Double-space throughout; use dividing lines as needed (fig. 4). Fig. 4. A table in a research paper. Any other type of illustrative visual material—for example, a photograph, map, line drawing, graph, or chart—should be labeled Figure (usually abbreviated Fig. ), assigned an arabic numeral, and given a caption: “Fig. 1. Mary Cassatt, Mother and Child, Wichita Art Museum.” A label and caption ordinarily appear directly below the illustration and have the same one-inch margins as the text of the paper (fig. 5). If the caption of a table or illustration provides complete information about the source and the source is not cited in the text, no entry for the source in the works-cited list is necessary. Fig. 5. A figure in a research paper. Musical illustrations are labeled Example (usually abbreviated Ex. ), assigned an arabic numeral, and given a caption: “Ex. 1. Pyotr Ilich Tchaikovsky, Symphony no. 6 in B, opus 74 (Pathétique), finale.” A label and caption ordinarily appear directly below the example and have the same one-inch margins as the text of the paper (fig. 6). Fig. 6. A musical example in a research paper. If you print your paper, use only white, 8½-by-11-inch paper of good quality. If you lack 8½-by-11-inch paper, choose the closest size available. Use a high-quality printer. Some instructors prefer papers printed on a single side because they’re easier to read, but others allow printing on both sides as a means of conserving paper; follow your instructor’s preference. Proofread and correct your research paper carefully before submitting it. If you are checking a printout and find a mistake, reopen the document, make the appropriate revisions, and reprint the corrected page or pages. Be sure to save the changed file. Spelling checkers and usage checkers are helpful when used with caution. They do not find all errors and sometimes label correct material as erroneous. If your instructor permits corrections on the printout, write them neatly and legibly in ink directly above the lines involved, using carets (⁁) to indicate where they go. Do not use the margins or write a change below the line it affects. If corrections on any page are numerous or substantial, revise your document and reprint the page. Pages of a printed research paper may get misplaced or lost if they are left unattached or merely folded down at a corner. Although a plastic folder or some other kind of binder may seem an attractive finishing touch, most instructors find such devices a nuisance in reading and commenting on students’ work. Many prefer that a paper be secured with a simple paper or binder clip, which can be easily removed and restored. Others prefer the use of staples. There are at present no commonly accepted standards for the electronic submission of research papers. If you are asked to submit your paper electronically, obtain from your teacher guidelines for formatting, mode of submission (e.g., by e-mail, on a Web site), and so forth and follow them closely.